I noticed this on Labor Day. It was my first fall air inhale of the season. It was just as refreshing as smelling that first spring air a few short months ago. Our clothes smelled like fall too – I smelled a friends sweatshirt, just to make sure. Yep, he smelled like fall. A little bit fresh, crisp, cool air and a little bit bonfire. That is a good smell. Its a smell you don’t notice until everyone comes inside and its downright intoxicating. All of us in sweatshirts and jeans, hair windblown, cheeks flushed….fall is here. I think. What can I say… I love it. I love the coziness of a sweatshirt and jeans on a cool evening after a summer of being too hot for shorts and a tank top. I love opening windows and getting a slight chill from the breeze. I love needing a blanket at night. On Labor Day, we had an impromptu cookout. We played wiffle ball, we used ghost runners, the boys showed off their pitching skills. We had corn husk bases. We talked babies…there is a newly pregnant one among the bunch! (not me!) We grilled corn on the cob and brats. We ate zucchini casserole, resurrected from a grandmothers recipe file. We fell in love with yellow watermelon. We tasted Oktoberfest and Pumpkin Ale’s. We picked our favorites. We borrowed sweatshirts and hoodies. We embraced the crisp air. We rode four wheelers around the pond/lake and peeked in the windows of the empty house for sale down the road. We were curious. We played football on the four wheelers. We realized the necessity to hold on to the sissy bar when the driver ‘guns’ it. (no one or their ego was hurt in our play). And most important, we laughed. We laughed a lot. And we can’t wait until the next get together. 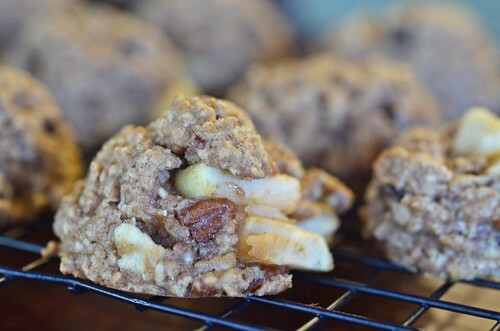 Corn maze and apple crisp…here we come! It was impromptu and for once in my lifetime I didn’t have a baked good on hand. So I brought hot dog buns. I had a Baby Houseman moment…However, now, just a day later…I have 4 dozen cookies just waiting to be eaten…funny how that happens. These would have been great too for the first fall weather. 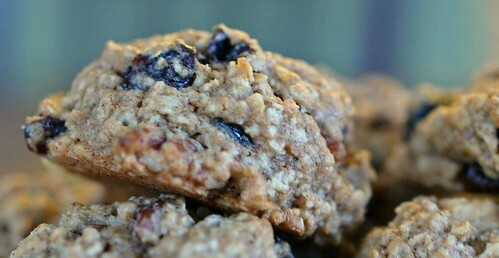 Full of oats, raisins, pecans, and apples – they are warm and cozy. Perfect for any bonfire or tailgating party. So make them, enjoy them, and take a deep breath. Because it smells good. 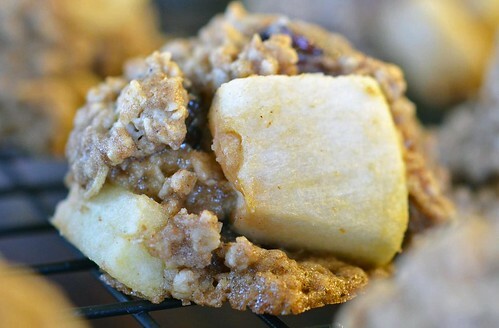 In a small/medium bowl, mix together wheat flour, salt, baking soda, cinnamon, nutmeg, coriander. Set aside. In a mixing bowl, cream together butter and brown sugar. Add milk, egg, and vanilla and mix until combined. Beat in the flour mixture into the wet ingredients, just until combined. 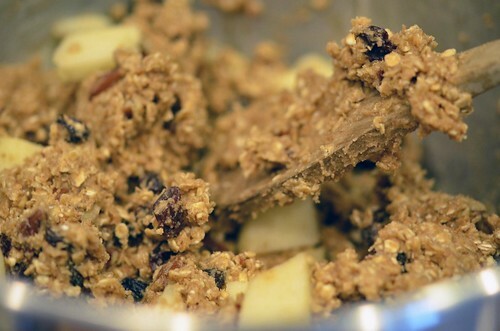 With a wooden spoon, stir in quick oats, raisins, pecans, and apples. Each one separately. Scoop out onto a parchment lined baking sheet. They do not spread, so you can place them close to eachother. Bake in preheated oven for 11 to 13 minutes. When done, remove from baking sheet and place on wire cooling rack. Cool completely. Store in covered container or freeze for later enjoyment.